On a gorgeous day in June, nestled in between the cold and the rain, a small crew of JK Food Group were afforded a perfect glimpse into the magic of Island Creek Oysters. The family run company is a favorite in the Boston community, their brand held in highest regard for their quality, consistency and willingness to work. As their website reads, “fresh product delivered straight to your kitchen by kind people. Period.” What chef isn’t going to love them? The property is eye-opening, not just because they produce so much out of so little, but because they are simultaneously proud and humble – like happy parents to the oysters they are putting out this year. From the hatchery team to the farmers to the owners and operating managers, their smiles break open like the top shell popped off the oyster in the hands of Bill Weiss, Director of National Sales and our personal tour guide for the day. 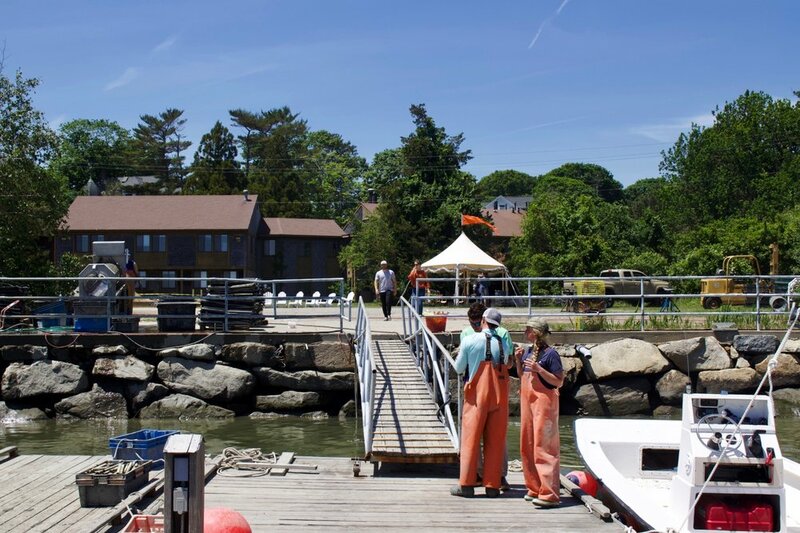 We began at the hatchery, a warehouse bordering to Duxbury Bay surrounded by dry docked sailboats and whalers. “Hi Hannah,” Bill says, “She’s the boss.” A smile and a wave and she’s on her way, the wellies on her feet telling the tale of the time spent in ankle-deep water each day. Duxbury Bay water which is pumped in, filtered, and sterilized when necessary, and provided to everything from the algae grown to feed the oyster larvae to the tanks for the various stages of the oyster’s growth. Once they are big enough they will move out to Duxbury Bay where they will grow to the ripe age that delivers the most delicious oyster. The advantage of raising the oysters and their food adjacent to the local water they’ll end up in is proving an environment that increases their resilience to natural ecological conditions, so their chance of survival is higher. 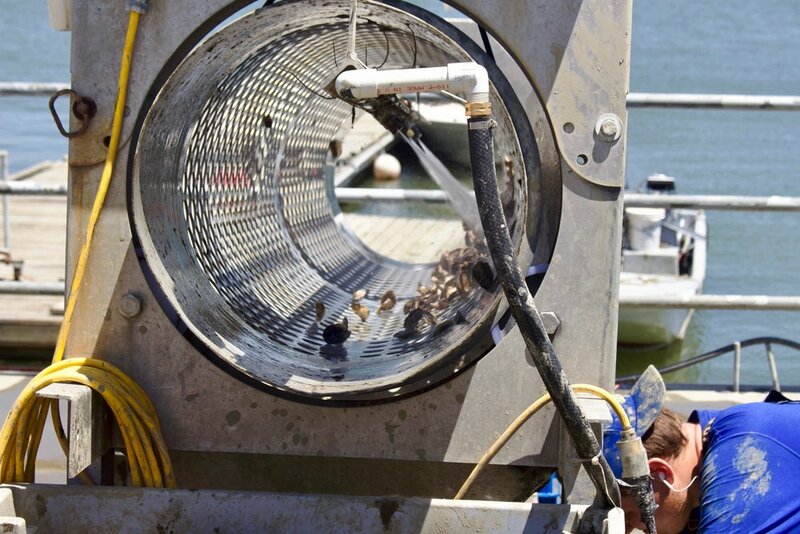 Additionally, the full-grown oysters that are brought back to the hatchery to spawn can be hand-picked. Culling is the technique of choosing the traits within the grown oysters that they would like to spawn. ICO maintains complete quality control of the shell size and shape of their oysters. Algae is the oyster’s food, and a large part of the hatchery is devoted to its production which begins long before the spawning starts. By the time there are 5 million dust-sizes oyster babies, there is plenty of food to feed them. In the back room of the hatchery, test tubes, beakers and giant graduated cylinders look more like a chemistry lab than a farm, but our high school biology and chemistry served us well enough to at least understand the reason for the fluorescent lighting lining the walls that stays on 24 hours a day and the carbon dioxide bubbling up into each container – photosynthesis! Hannah has a firm grasp on each vessel of algae growth, all meticulously marked like every chef dreams his walk-in to be. The various colors are respective strains Hannah chose based upon empirical evidence that they help shellfish to grow. Numerous strains are raised in order for the oysters grow with a wide-ranging diet. Each container must be marked clearly to distinguish which stage of microscopic oyster mouths that it will fit inside. Otherwise, Bill explains, it would be like trying to fit a cheeseburger into a baby’s mouth. On the wall there is a photo of Hannah smiling with the operators of a blood clam farm in Zanzibar that Island Creek aids to support an economically and ecologically sustainable source of protein for local consumption as well as income for women in Zanzibar’s local villages. They also work with Dr. Valentin Abe, founder of the Caribbean Harvest Foundation, to distribute Tilapia Fish Farming kits which provide families reliable income as well as provide a year-round source of protein for their families. Elsewhere in the hatchery are tanks holding the millions of oyster larva and fresh Duxbury fed tubs with millions of pieces of ground up oyster shells. When the oysters become the size of a sand grain they will be transferred there so they can attach to one piece, for life. This is a new system implemented this year that has increased the yield so much that they are already finished spawning. When we ran into Owner and president Skip Bennet he expressed the proud sorrow of an empty nester, “I went into the brood stock room at the hatchery and was a little bit like ‘aw, not ready to shut the hatchery down’ because we usually would keep spawning but we got so much seed out this year we’re not doing it anymore.” He laughed in an easy breezy way that seems more California than New England oyster farmer, and which immediately identifies the mantra of the entire company. 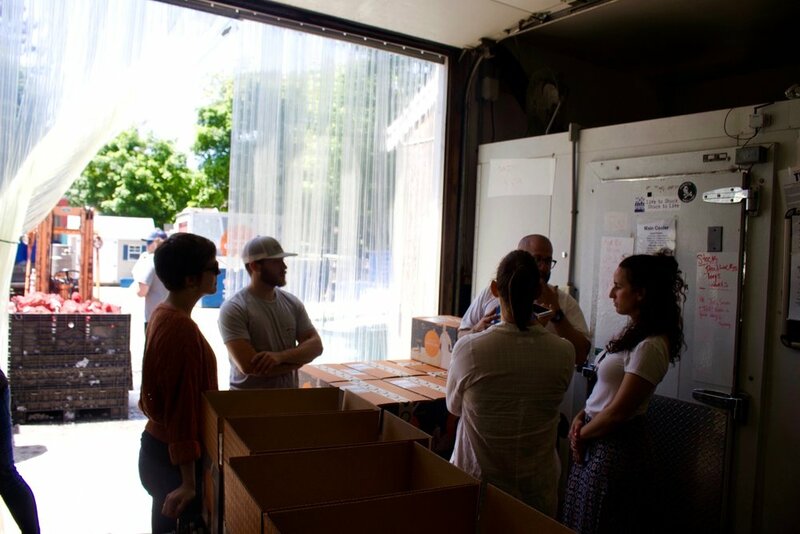 They ship to over 500 restaurants coast to coast but each and every member of the company were heading down to the distribution building to count clams the next day. They are growing, but not too fast, and not away from Duxbury. “We’ve got to do a Toro night out here,” Skip said referring to a Monday night chef series they’ll be starting after 4th of July and running all summer at their new on-property open air bar. “And,” he was sure to mention, “we have to have the corn.” Don’t worry Skip, we cannot wait to come back, with the Toro menu as your oyster. Enjoy the slide show below of the rest of our happy day. Chatting with Skip at the ICO boat ramp. The Island Creek Oyster "plex". 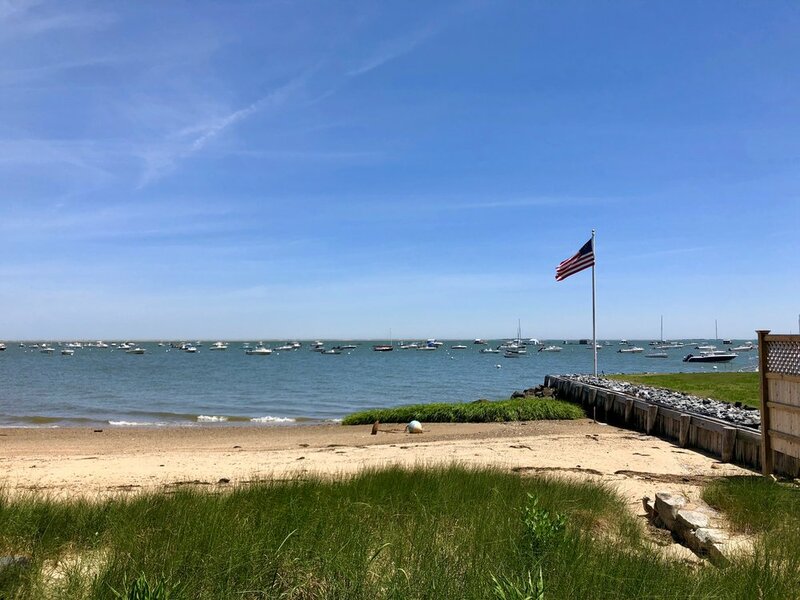 Oyster plex's on Duxbury Bay. The dock, and what is to be the ICO patio bar. Oysters are tumbled 2-3 times over their lives to maintain shell shape. All smiles viewing the millions of dust-size oyster babies. ICO delivers coast to coast out of this humble warehouse space. The Shop. Left to right, Charlie, Ellie, Jen, Rachel & Bill Weiss.